UNITES 2016 Virtual Conference Proceedings have been published here. 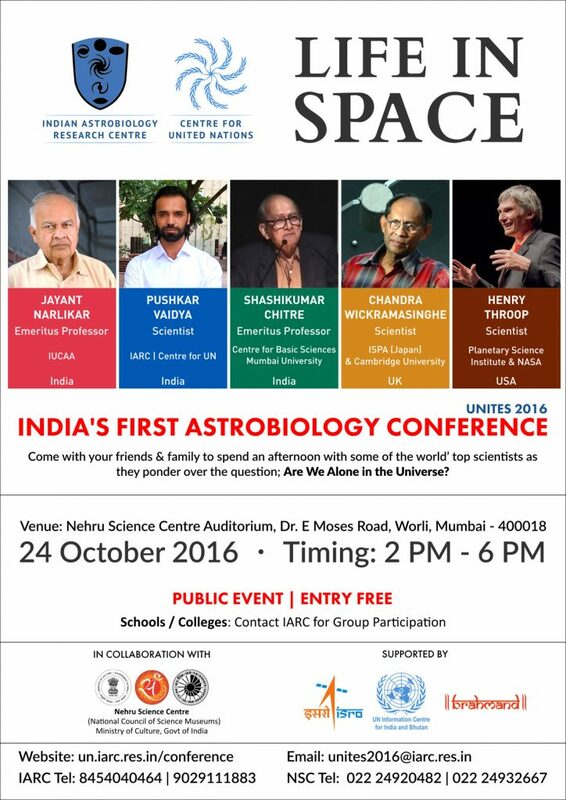 On October 24th, 2016 people from across India showed up to attend India’ first Astrobiology Conference – Life in Space. The auditorium overflowed with people from all walks of life who had come to listen to some of the world’ best scientists talk about Astrobiology. Pushkar Ganesh Vaidya, the Scientist & Head of Mumbai-based Indian Astrobiology Research Centre (est. 2006) and IARC Centre for United Nations – welcomed the august gathering. 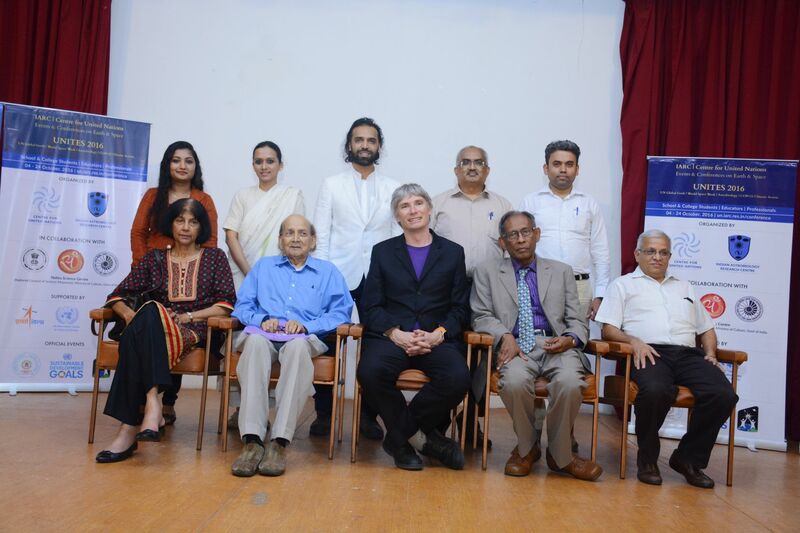 From (extreme right, first row): Prof. Jayant Narlikar, Dr. (Mrs) Managala Narlikar, Mrs. Priya Wickramasinghe, Prof. Chandra Wickramasinghe, Dr. Henry Throop, Shri. Shivaprasad Khened and Shri. Shrikant Pathak. And then began, an extraterrestrial extravaganza. 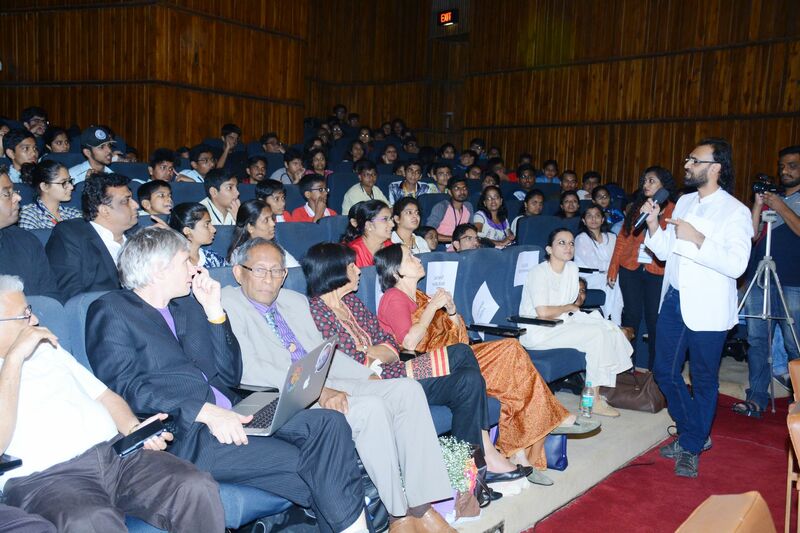 The conference began with the talk by world-renowned cosmologist, Prof. Jayant Narlikar, IUCAA, Pune. He spoke about Search for Microlife in the Universe. And of course, Prof. Narlikar was asked questions, lots of them! At one point in time, the chair of the conference had to intervene to ensure the Q & A session goes well. And then, there were more questions. Here are a couple of more photos. Next, Prof. Chandra Wickrmasinghe from Cambridge, U.K. delivered the first Arthur C Clarke memorial lecture. He spoke about, Panspermia – the Second Copernican Revolution. On this occasion, a fund called, “Chandra Wickramasinghe Fund for Panspermia Research” was announced; this fund will encourage astrobiology research amongst students through the National Space Sciences Curriculum. Prof. Chandra Wickrmasinghe was asked lots of questions as well. Then, Dr. Henry Throop delivered an engaging talk about NASA’ contribution to search for life in space over the past 50 years. And now it was Dr. Throop’ turn to answer questions. 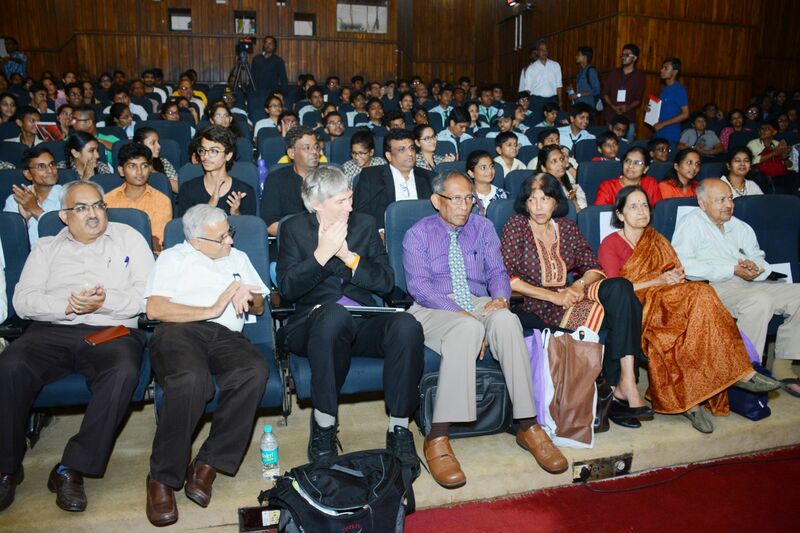 The audience was then enthralled by a Panel Discussion led by India’ leading astrophysicist Prof. Shashikumar Chitre and India’ leading astrobiologist, Pushkar Ganesh Vaidya. Prof. Wickramasinghe and Dr. Henry Throop joined the panel discussion as well. What followed was a spontaneous exchange of ideas that left the audience enthralled. And then, the panel took questions. And the Questions just kept flowing. Here are a few more photos. And then the scientists, interacted with the audience. And then of course, the customary group photo. 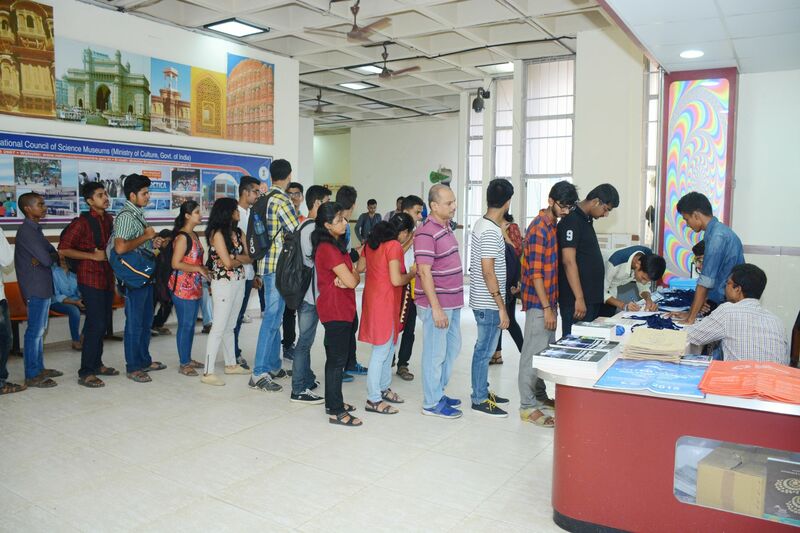 And thus, concluded India’ first Astrobiology Conference – it was part of IARC | Centre for United Nations Events & Conference on Earth & Space (UNITES 2016) is a twin-theme event and conference being organized in collaboration with Nehru Science Centre, Mumbai.